3.1.19 Building To 100 Is Really Hard Work! 1.25.19 Family Game Night At Perkins School Was A Blast! 12.20.18 Perkins School Students Learn Helping The Newark Food Closet Is Great! 9.25.18 Lady Reds Swimmers Participate In "Duel In A Pool"
9.14.18 Rehearsals Underway For "Midsummer/Jersey"
In the past, I have written to you about our status as a Focus District under the New York State Education Department (NYSED) accountability system. With the recently passed federal legislation, that status has changed and I need to explain how it has changed and what it means for our school district. The previous federal education law was called No Child Left Behind and that law drove NYSED policy and procedures. The new federal education law is called the Every Child Succeeds Act (ESSA) and it has changed the accountability system and some of the language and processes that we have to follow. Please see the fact sheet, attached to this letter, for more information on ESSA and the new accountability system. 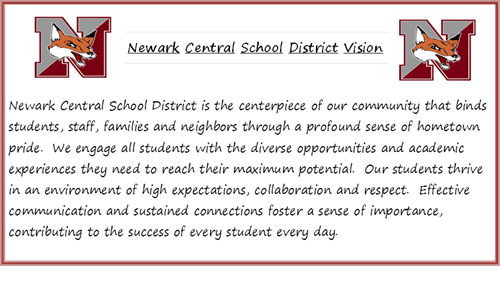 Instead of being labeled a Focus District, as we were under the previous law, Newark has now been designated a Target District. This is roughly equivalent to the previous Focus designation. More specifically, we have three schools that fall under the new Comprehensive Support and Improvement (CSI) designation; Perkins Elementary, Kelley Intermediate and Newark Middle School. Lincoln Elementary and Newark High School were designated as being in good standing. The CSI schools will be having visits from NYSED personnel (Kelley School already had their visit) this spring and NYSED will provide feedback to our team for planning and school improvement purposes. Kelley parents/guardians provided good feedback during their visit and there will be opportunities for Perkins and Middle School families to do the same in March 2019. The CSI schools have this designation due primarily to performance of students on the 3-8 math and ELA assessments given over the past three years. In addition to the usual math and ELA assessments, in 2019 ESSA will also use the 4th and 8th grade science assessments in the accountability system. This is why it is critically important for all students to take these assessments and to try their best! These assessments are no longer tied to the evaluation of teachers and we do not use the results to punish students or to retain them. Instead, we use the results of these assessments to help us figure out how to intervene and provide assistance to students as they transition to and strive to achieve mastery of the new NYS Next Generation Learning Standards. In addition, under ESSA there is a new area that we must pay closer attention to, which is chronic absenteeism. A student is labeled chronically absent by NYSED if they miss 10% of a school year or more. Since we are obligated to have a minimum of 180 student school days per year, that means a student who misses 18 days or more over the course of a school year is considered “chronically absent.” We believe that all students need to be in school as much as possible and that attendance is important for many academic and social/emotional reasons. An additional reason that attendance is important under the new ESSA system is that Perkins would not be a CSI school, if we did not fail to meet the chronically absent threshold in that building. Under the new accountability system, Perkins was designated CSI and Lincoln was not due only to the difference in chronic absenteeism. It is important to let you know that there is no distinction made between excused or unexcused absences in this new ESSA accountability system. A student who skips school is counted absent in the same as a student with a legitimate illness. Because of this change in how we are being held accountable, we have examined our attendance practices throughout the district. In order to bring consistency across our five buildings and to comply with the new NYSED focus on chronic absenteeism, we will be sending periodic notices to parents and families regarding attendance throughout the year. We will treat all instances of missed days, excused and unexcused, the same way when it comes to these notices. The goal of this communication will be a reminder to families about the importance of being in school as well as a check within our system to ensure that we are offering the right support to families who might need assistance with attendance issues. We do not want to make anyone feel bad or guilty about legitimate absences, as we understand that there are many reasons that students need to miss school. However, in several of our school buildings, we need to do better with attendance and we wanted to explain to you why we are changing our protocols and communication regarding this issue. If you have any questions about the accountability status or the emphasis on chronic absenteeism, please feel free to reach out to me, Krista Lewis, our Assistant Superintendent of Curriculum and Instruction, or your child’s building Principal. Each building will be sending home additional communication regarding the change in attendance practices and families of students in Perkins, Kelley and our Middle School will be receiving more information regarding the CSI designation and opportunities to provide feedback and partner with us as we work to improve our performance. Our goal remains to help every student, every day become the best version of themselves. Thank you for your time, attention and continued support.